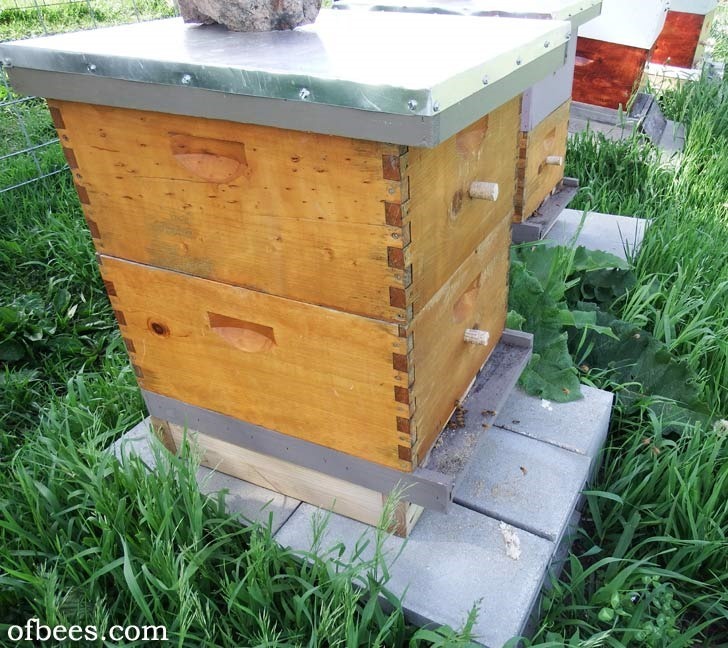 Hive Shares – Adopt a Bee Colony! 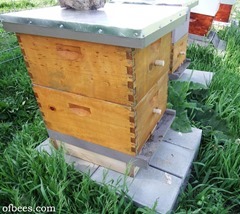 I suppose it’s probably not a typical problem, but we needed to ‘yak-proof’ our bees this year. 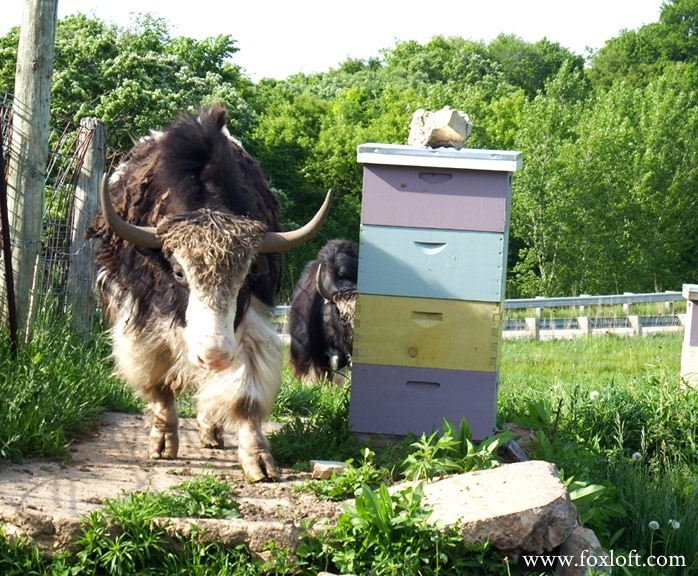 Our apiary is in a large pasture with our small herd of Tibetan yak (and one Highland cow), who conveniently discovered that the hives made great scratching posts. To prevent incidents, we decided to build a yak-proof fence around the hives so everyone could live in harmony. 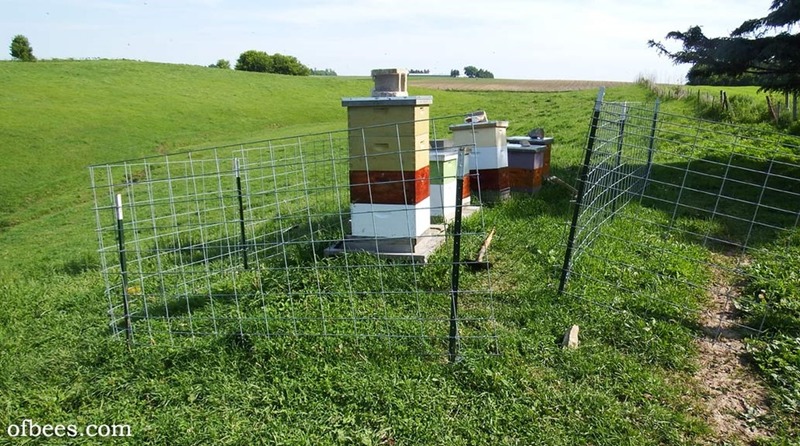 We used cattle panels to make a bee sanctuary where the bees could live in peace, undisturbed by bovine antics. The barrier worked quite well, though the yak still came right up to watch us work every time we were checking on the bees. Here are a bunch of newly installed hives, thanks to our awesome bee sponsors, mostly split off the overwintered colonies. 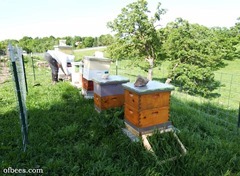 This is a newer colony in the late spring, you can see there is a little activity of bees going in and out from the entrance yet. A closeup of the entrance to the hive above. 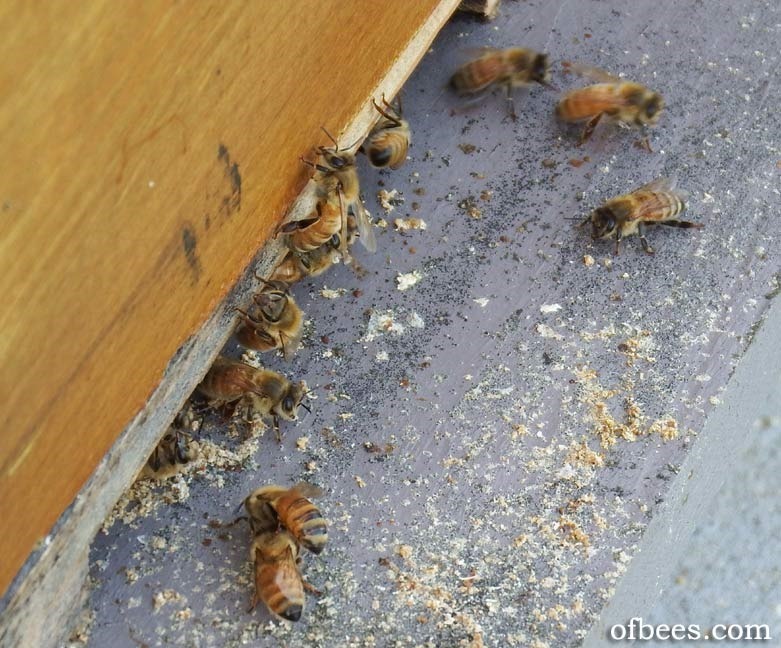 The yellow specks are chewed wax cappings from where the bees were getting at stored honey. 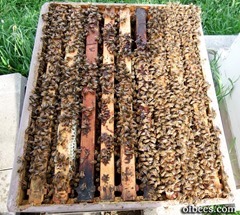 A newer hive is dependent on stored food until it has a large enough population of older, foraging bees to bring in enough nectar to sustain the colony. Guard bees are posted at the entrance to check the scent signature of all bees returning to the hive, this keeps foreign bees out. This is an important duty since colonies will rob each other if they can sneak in or overpower a weaker colony! 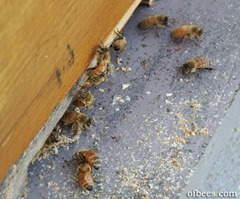 A nicely filled box of bees in the early summer, ready to expand into a larger colony by adding more empty boxes. 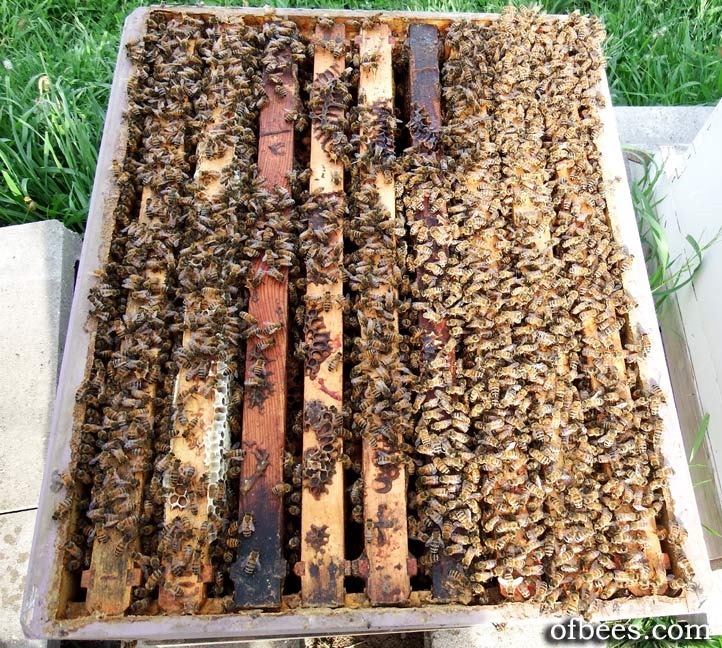 The dark staining on some of the frames is from pollen – the older the frames are usually darker from bees walking across them repetitively with pollen-stained feet. 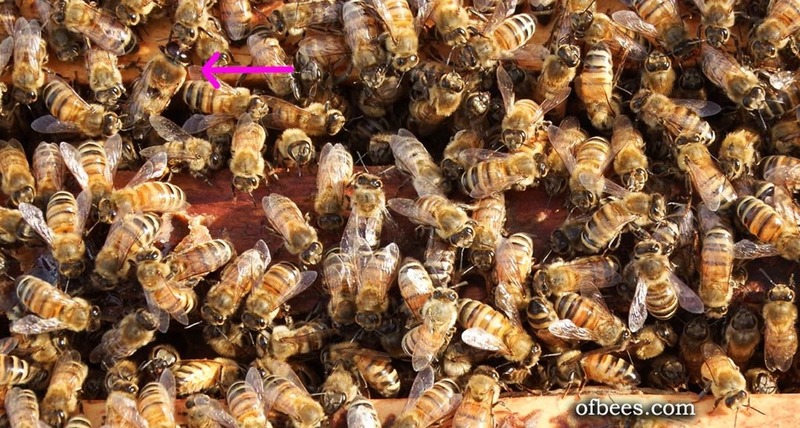 The pink arrow points at a drone (male bee), which start to appear here in early summer. The drone’s sole purpose is to breed with outside queens to help spread a colony’s genetics, so they are considered a luxury and aren’t produced unless a hive is strong enough to support these otherwise non-productive members. The drones serve an important purpose in breeding, but they don’t gather any resources or help inside the hive. If they aren’t out cruising around looking for a mate they are loafing around, eating and getting cared for, so they are ‘expensive’ for a colony to make and keep. Subscribe to our mailing list for Bee Updates!